In November, it was Hayley Scamurra. Four weeks ago, Maddie Elia got the nod. 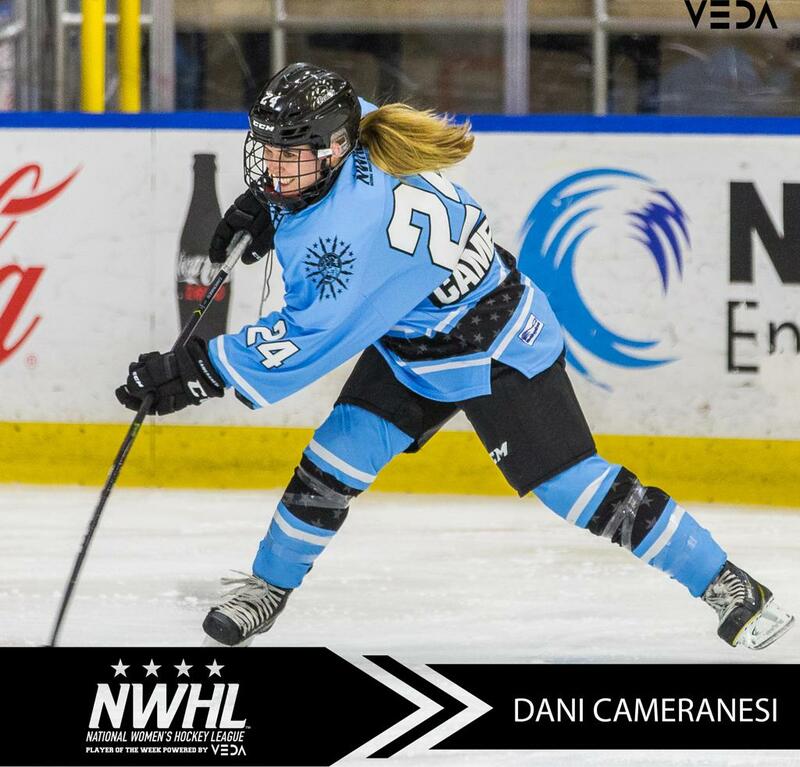 And now, completing the hat trick for the top line of the Buffalo Beauts, Dani Cameranesi has been named the VEDA NWHL Player of the Week. In Buffalo’s important 4-1 victory over Boston on Saturday at Harborcenter, Cameranesi led the way with three points. In addition to a goal, she had assists on Elia’s league-leading 10th and 11th goals of the season. In her rookie professional season, Cameranesi has 4 goals and 10 assists for 14 points in 12 games – including 7 points during the team’s current 4-game winning streak. Combined, the juggernaut trio of Elia, Scamurra and Cameranesi has 50 points in 12 games this season. The Minnesota native joined the NWHL and the Beauts after four seasons with the Golden Gophers of the U. of Minnesota, where she scored 93 goals and added 108 assists for 201 points in 143 games. A year ago, she won the gold medal with Team USA at the Olympics, sharing the team lead in scoring. 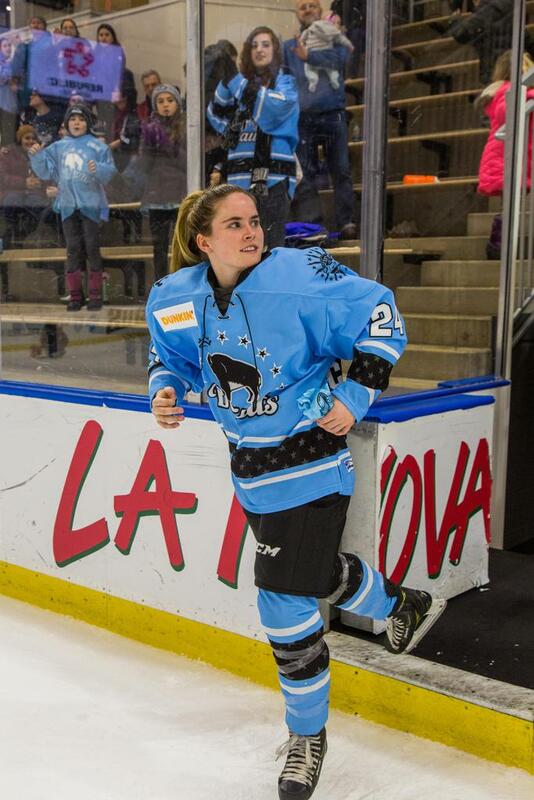 Her speed, deft playmaking and hard shot have made her a perfect fit for the Beauts, who are in a battle with Boston and Minnesota for the top seed in the upcoming Isobel Cup Playoffs. In two weeks, Cameranesi will join Kendall Coyne Schofield, Shannon Szabados, Amanda Kessel and many of the league’s best at the 2019 NWHL All-Star Game in Nashville. Nate Oliver spoke with Cameranesi after the victory on Saturday. What’s your reaction to being named VEDA NWHL Player of the Week? “I think it's pretty cool, but it's a result of my entire team's effort. Being on a line and on a team with such great players makes it a lot easier to succeed personally and as a team. We have a team-first mentality all around." The NWHL All-Star Game is just around the corner. What are your thoughts on being able to take part in it? “I'm really excited! I was up watching the NHL All-Star Game and seeing Kendall Coyne-Schofield actually compete in it was pretty amazing. I think she's clearly going to be the fastest skater for the women. I'm just excited to be in Nashville and to be around all those girls. Have a little fun and be able to showcase what the NWHL and women's hockey are all about." You and your linemates are arguably the top trio in the NWHL. How much did you know about either of them before you came to Buffalo?" "I had played with Maddie Elia a few times in U22s and Under-18 teams for USA, but didn't know much. I just know that they're powerhouses, and it's really exciting to be able to be on their line and be connecting the way that we are. They're great and fun to play with." What’s your message for the Buffalo fans at this late point in the regular season, just before playoffs? "Just keep doing what you're doing! I love playing here on home soil in front of the fans, and having packed houses is really exciting. It brings the energy for us and makes it a lot easier for us to bring that same energy for them."